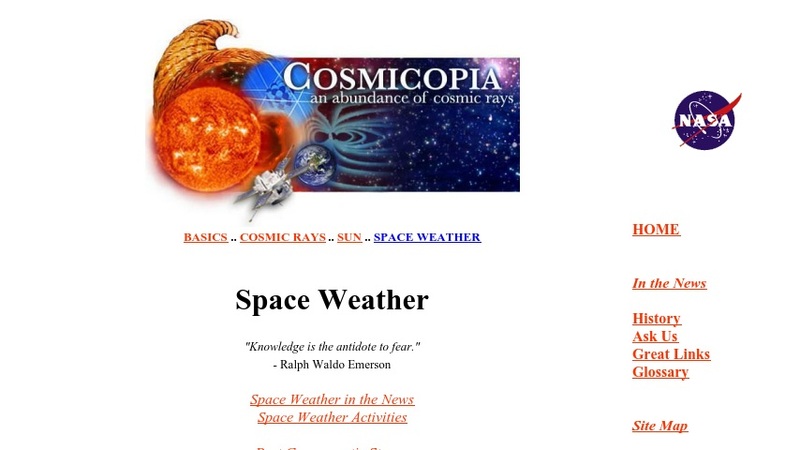 Visitors can learn about the causes of "space weather" and phenomena like auroras, interruptions in electric power service, and interference with communications. Definitions of solar activities such as coronal mass ejections, solar energetic particles, and coronal holes are provided, along with explanations of how they affect Earth's magnetic field and atmosphere. Remotely-sensed imagery of solar activity and an animation of a coronal mass ejection impacting Earth's magnetosphere are available for viewing and downloading. Links to news articles and other related sites are also included.